B for Baker now has a flight engineer. This afternoon, I received in the post a slightly fat envelope from England. As I opened it, a dozen or more photographs tumbled out onto my desk. The letter inside was from Steve Butson, to whom I had sent the latest of my speculative letters. “In answer to your question”, it said, “yes, Kenny Tabor was the Uncle I never knew”. With that simple phrase, the great relative search was complete. Steve wrote me a fantastic four-page letter in which he explained a lot about his family. Some of the names were familiar, thanks to Chris Tabor’s careful work on Ancestry.com. Some were new to me. But they were all connected to the buck-toothed young chap who appeared in some of the photographs. Sgt Kenneth Harold Tabor had an older brother and a sister called Bill and Betty, and a younger brother called Don. He worked at a garage in Westbourne before he joined the Royal Air Force on his eighteenth birthday. Perhaps it was unsurprising, then, that he would train and fly as a flight engineer. Ken was killed when Lancaster LM475 B for Baker failed to return from Lille on 10 May 1944. The youngest member of the crew, he was just nineteen years old. The crew is complete. I am now in contact with relatives of each of the seven men who were on board B for Baker when it was lost. It’s taken about three years of fairly steady work to reach this point. Now it’s time to find out as much as I can about each one, to give a human face to the story. And ultimately? The seven men in the crew of B for Baker were drawn together long ago by events well beyond their comprehension or control. These same forces now forever link their seven families. It’s my goal to one day bring all seven together again – for the first time in nearly seven decades. Like crewing up, once more. the last remaining member of the crew of B for Baker. 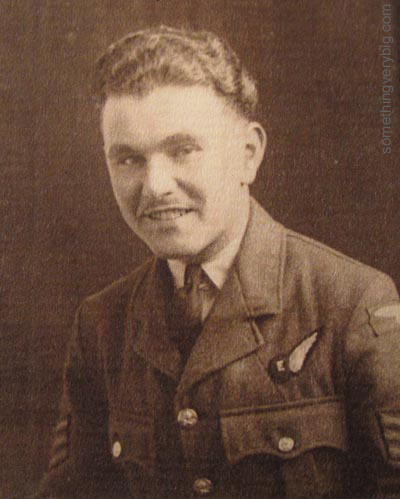 Sgt Kenneth Harold Tabor was the crew’s Flight Engineer. His service record (which I have just received from the RAF) shows that he was the youngest on the crew, enlisting on his 18th birthday. Sadly he was killed before reaching his 20th. To this point, the search has been a case of sending letters willy-nilly to Tabors scattered all around the UK, simply because that is their name. I’m up to 12 so far. Many of those I have heard back from have been related to each other. Not all have replied yet but to date I have hit dead ends. As it has turned out, there are many more Tabors around than I previously anticipated and, well, to continue in this direction will take (a) a very long time and (b) lots of money. So a new direction has been needed. Enter Chris Tabor, the latest to receive one of my speculative letters. He is no relation to Ken, but it happens that he is into family history research, has an Ancestry.com membership and, most importantly, knows how to use it. So he’s been doing some digging for me. Chris has uncovered records showing that Ken had two older siblings – a sister and a brother who appear to have been twins. Both married and had children who would now be in their 60s. I plugged the names that Chris sent me into a useful website called 192.com, and it has come up with postal addresses for a number of people of those names. Those six people will shortly be sent one of my now legendary speculative letters. Only this time, I’m hoping that the letters are slightly less speculative than they have been in the past. This time there is a document trail that suggests we might be on the right track.